Spaghetti is a regular dish when there is a kid at home. I was in mood of clearing up the fridge and found some kaffir lime leaves left over. 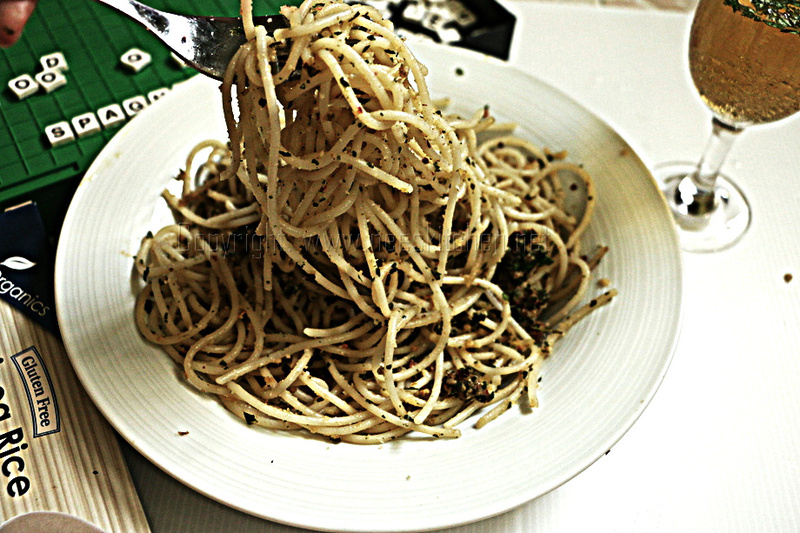 I decided to make spaghetti by mixing kaffir lime leaves instead of regular Italian basil leaves. 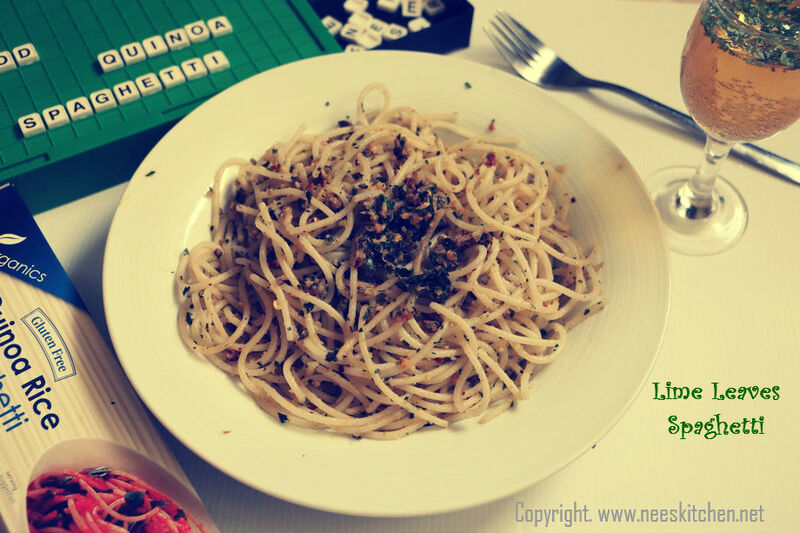 I did the lime leaves pickle and add it to spaghetti. It turned out to be tangy and super delicious. So I decided to post this after trying out couple of times by checking at the feedback of my family members. All of us liked it in spite of repeating it thrice within a span of 10 days. This dish is very fast to do if you have the lime leaves pickle handy and it is easy to pack it for kids in the early morning for school lunch box. I prefer to use quinoa based spaghetti as it gluten free and you will not feel heavy even if we have a bit late night for dinner. You may use any form of spaghetti. Each spaghetti packet will have the instructions to cook the spaghetti and in this post I have followed the one given in my packet. Adding Parmesan cheese is optional however it definitely enhances the taste. This spaghetti can be consumed by all ages groups including the elderly if we omit the cheese. 1. Prepare the lime leaves pickle using the instructions given in my earlier post. Click Here. 2. Follow the instructions in your spaghetti packet and cook the spaghetti. 3. Once cooked, strain it and run the cold water and mix it. 4. Take a pan add oil and once heated add chopped garlic. Let it fry and turn golden brown. 5. Add Lime leaves pickle, garlic powder and sauté. Adjust with salt if necessary. 6. Add the cooked spaghetti and mix well. 7. Add parmesan cheese and mix well. 8. Leave it for 5-10 mins before serving so that pickle and the spaghetti marinates well with the dish. Spaghetti is ready to be served. Enjoy with some healthy drink. I made mint lemonade for this post. If there is no garlic powder and you may add additional garlic but the taste is good if we put them in powder form. If you are packing in a box, the dish becomes much tastier if you keep a small quantity of parmesan cheese as a separate topping for the kids just before they eat. If you want more spice you may add dry red chili roasted and powdered like flakes. Adjust the taste of lime leaves pickle if your kid cannot take it spicy. You may adjust the chili content in this pickle accordingly. Parmesan cheese is optional and you may increase or decrease the quantity based on individual preference just before serving.